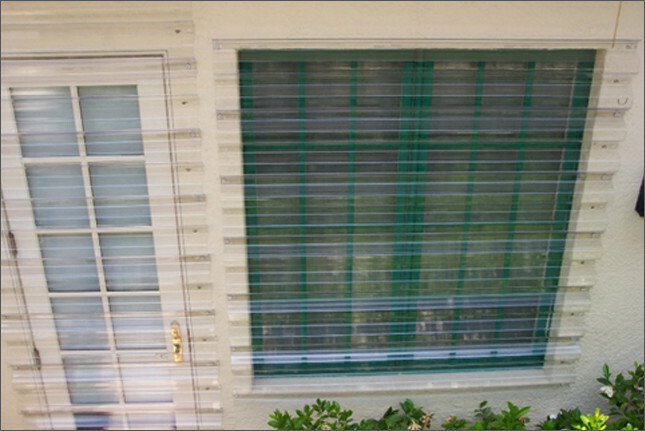 Our Clear Hurricane Storm Panels are simple, strong and affordable! When you are looking for affordable, simple and effective hurricane protection in Estero, Florida, Storm Guard Solutions is the company to call. Estero is located between Naples and Fort Myers. Over the past 15 years, growth has exploded in this community with new shopping centers, housing developments, parks and golf courses. Estero is also subject to both hurricanes and tropical storms. Hurricane protection is your first line of defense. If you are looking for the protection of storm panels but don’t want to be left in the dark, clear polycarbonate hurricane storm panels are perfect for you. Old metal panels leave the interior of your home dark and are very heavy and hard to install. When you choose our clear polycarbonate storm panels you will love the way our panels are optically clear which allows light to enter your home so that you are not left in the dark when the power goes out and the sun goes down. Our panels are also light weight making it easier to install than other types of panels.